When to address a roof repair or replacement and how to go about it are typically cost-based decisions. It is often perceived that addressing a roofing issue and over-cladding the existing roof will be more cost effective than replacing the entire roof as part of a maintenance plan. Unfortunately, oftentimes the decision to repair or to over-clad does not take into account a full investigation which discovers the root of the issue. 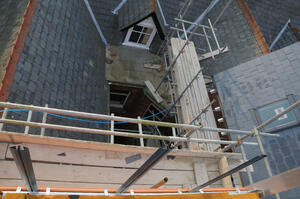 For example, an initial decision was made to roof over the existing assembly of a 1920’s building to keep costs down. However, it was further revealed during an unrelated investigation that the wood rafters connecting to part of the masonry wall had been severely damaged by water intrusion and insects. This discovery ultimately meant that the structural integrity of the building was in jeopardy. Read the full article and case study in the recent Failures Column of Construction Specifier. For additional roofing related issues read, Everything Leaks: Testing & Diagnosing Roofing Leaks.